The Stableford golf scoring system awards players points based on their score on individual holes in relation to a fixed score, often par. The player who accumulates the most points is the winner. Golfers can play a Stableford competition with or without handicaps. When playing with your handicap, you must allocate your handicap strokes by holes, rather than subtract it at the end of the round. Obtain an official handicap index by joining a USGA-certified golf club and submitting your scores. When you have at least five scores, the club will send them to its handicap service, which will calculate your handicap index via computer using a complicated formula. Convert your handicap index into the course handicap by looking it up on the conversion table typically posted at most golf courses or plug your index into the course's handicap computer, which will give you your course handicap. Alternately, calculate your course handicap by multiplying your handicap index by the course's slope rating, then dividing by 113. Round that number to the closest whole number, which is your course handicap. Consult the course scorecard to find the order in which you should apply your handicap strokes. You will see that each hole is assigned a handicap number from one to 18. The player takes his handicap strokes in the order assigned on the scorecard. For example, a golfer with a 10 handicap receives a handicap stroke on the holes labeled handicap holes one through 10. For a handicap higher than 18, the additional strokes are assigned in order starting on the number one handicap hole. For example, someone with a 20 handicap will receive two strokes off on the one and two handicap holes and a single stroke off on the rest of the holes. Total your score for the hole, and then subtract any handicap strokes, if any, to obtain your net score. Write that number on your scorecard. Compare your net score to the fixed score for that hole, and write down the Stableford points earned for that hole, if any. Assuming the fixed score is par, a handicap-adjusted score of 1 over par (bogey) earns 1 point; a net par earns 2 points; 1 under par (birdie) earns 3 points; 2 under par (eagle) earns 4 points; and 3 under par (double eagle) earns 5 points. A score of 2 over par or more does not earn points. Add up the points you earned on each hole to determine your total Stableford score for the round. The player with the most points wins. 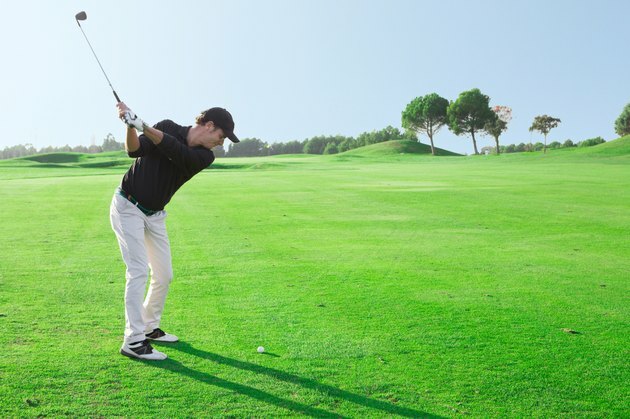 To speed up play, pick up your ball when you are two (or more) strokes over the fixed score on a given hole. You can modify the Stableford format, as the PGA Tour does, to provide negative points for bogeys and bonus points for eagles and double eagles.